With the United States elections underway between Donald Trump and Hillary Clinton, as well as less spoken of candidates, Gary Johnson and Jill Stein, one of the major topics of argument is the role that money in politics plays. 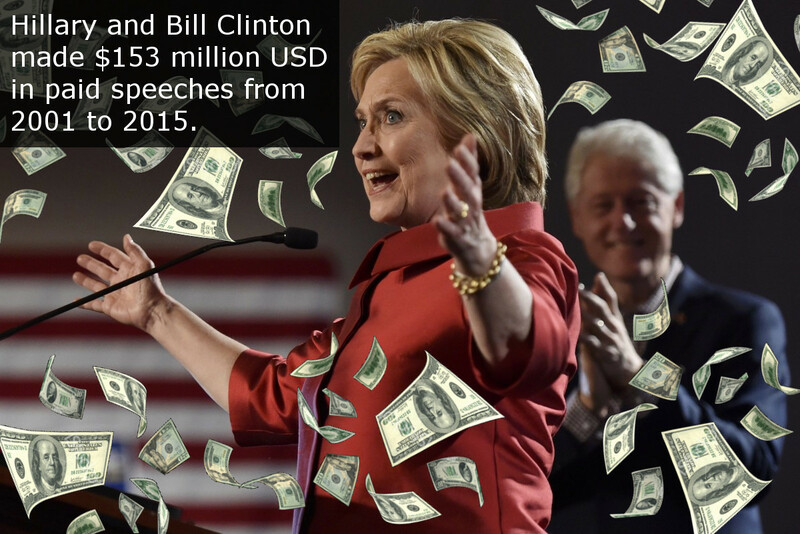 The biggest such example of money in politics comes from Hillary and Bill Clinton's numerous paid speeches since Bill Clinton left the presidential office in 2001 until last year, 2015. These speeches amounted to $153 million USD! There were 729 speeches documented, making the average pay out of about $210,000 USD. These are just the documented speeches, so it may actually have involved even more money. In that same timeframe, the Clintons have amased over $230 million personally. What even more astonishing is that in their over 40 year political lives, they have collected about $3 BILLION USD in political donations, of which $2 billion have gone to their Clinton Foundation, which has also been a point of contention among American politics. With so much money being involved in the American political system, it is safe to ask just what role it plays, and what kind of precautionary measures are there to ensure that no money is used against the American people.